I have never considered myself a spiritual person. Having grown up in a family of East Coast academics, our solutions to life's problems were rooted in Western science—headaches were nursed with ibuprofen, and anxiety was tackled with good old-fashioned denial. Things like homeopathy, astrology, and even meditation were written off as pure make-believe. As I've gotten older, my mind has opened a bit. Though I still take holistic practices with a grain of salt, I appreciate the desire to care for one's mind and body in a more personal, less clinical way. It's hard for me wrap my head around someone truly believing that the planets control our destiny and that constructing a shrine of amethysts can cure insomnia. But I know from experience that during moments of soul searching, sometimes you have to put logic aside. That said, I know plenty of people who live by these New Age ideologies year-round. They fill their days with exotic herbs and visits to their local shamans; they dot their homes with crystals and bundles of sage. In Los Angeles, where I live, this is especially common. From Kate Hudson to the neighborhood yoga instructor, sometimes it seems like everyone in L.A. has an "alternative" spiritual practice. Aesthetically, I'm as on board with this stuff as any Angeleno. I'm perfectly content to pepper my home in rose quartz. But realistically, I can't help but wonder: In their heart of hearts, do all of these modern Americans really believe in the power of spiritual healing? When they blame their IT mishaps and romantic troubles on Mercury's retrograde motion, is there truly no irony? After all, most folks weren't raised with such beliefs. Ultimately, my question is this: What draws Western people to spiritual healing? The other week, I felt like I might finally get my answer. My fellow editor Victoria and I received invitations to attend an all-female spiritual gathering in Venice Beach on the evening of the new moon. I knew instantly that I wanted to attend. I had no clue what to expect—would we be worshiping the planets? Resurrecting dead spirits? Taking ayahuasca? Whatever it was, I wanted in. In reality, I could never have predicted what was to come. To follow my surprising experience at this mystical moon circle, keep reading. 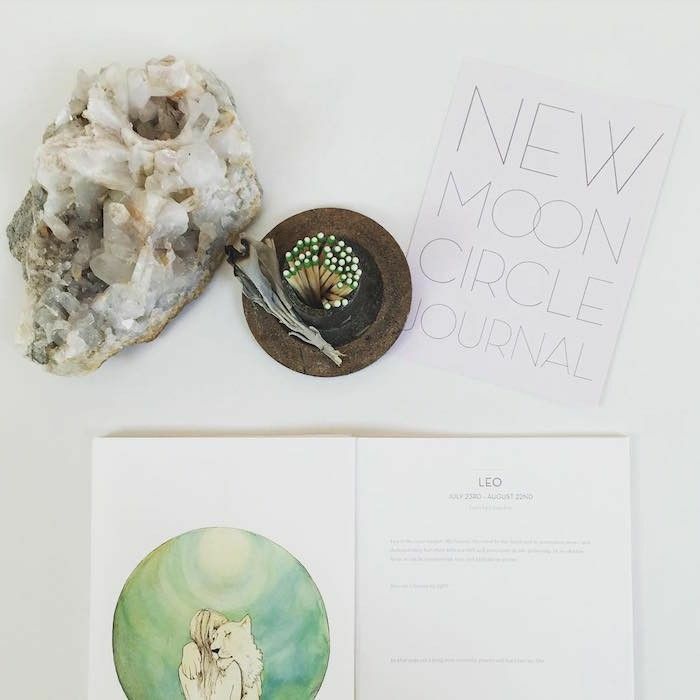 What Is a "New Moon Circle?" Women from all ages and walks of life are welcome at these gatherings, which last two hours and cost $25 to attend. There are events on the evenings of both new and full moons. Victoria and I were slated to attend the former. Victoria and I tip-toed into the main room. There, we were met with about 25 other women, all dressed in drapey fabrics and nibbling on complimentary chocolate. I will say, there exists a palpable calm in a room full of only women. Say what you will about spiritual "energy," but I am a firm believer in the unique atmosphere created by a group of female-identifying people. Victoria and I took seats on fluffy floor cushions at the far end of the circle. As we waited to begin, a fellow attendee in paisley (a regular, we learned) passed out Ocean Jasper stones to everyone in the room—a token of gratitude for the successes she'd manifested after months of dedication to the circle. I pocketed my new crystal, feeling both skeptical and optimistic. Soon, Mallis and her co-facilitator, Danielle Beinstein, made their way to the head of the room. Dressed in head-to-toe ivory linen, Mallis was and svelte and imposing. Clad in unassuming black yoga garb and beachy waves, Beinstein was the yin to her yang. At each new moon gathering, Mallis and Beinstein establish a topic of discussion, as well as questions to inspire thought and conversation among the group. To start, Mallis invited us to go around the circle and share a word or two to describe our intentions for the evening. Quickly I learned I wasn't the only spiritual newbie present. I wasn't even the only skeptic. Plenty of attendees shared that they were there to experience something out of the ordinary—to let down their guard and open their minds. This put me at ease, especially as Beinstein shifted to the next stage of our circle: summarizing the astrological state of the cosmos. Apparently, during our new moon, there were five planets in retrograde. According to the heavens, Beinstein said, this was the perfect time to revisit existing projects and relationships in our lives. Normally, this kind of thing would make me want to roll my eyes. But, in the spirit of of creating a safe and loving space, I suspended my disbelief. After all, these people didn't seem like total quacks. They seemed curious. Open. Supportive. I figured there had to be something to learn from them. Coming into this moon circle, I was prepared for moon-worshipping rituals and tribal psychedelics. But I was not prepared for what happened next. There weren't even drugs involved, but the activity that followed seemed to wash my cynicism away like water. What in your life requires time and effort to cultivate, maintain, and grow? Are you rushing the process or allowing it to develop over time? Can you re-evaluate the way in which you are relating to this process? In what ways can you continue to cultivate patience in your life? After privately recording our answers, Mallis and Beinstein invited attendees to share what they'd written, if they were moved to do so. I admit, I was expecting people to offer pithy, mystical platitudes. We were perfect strangers, after all. How concrete could the answers really get? Surprisingly, my predictions couldn't be further from the truth. For the next half hour, the women around me proceeded to share deeply personal, honest stories from their lives. They voiced concerns as great as deciding whether or not to leave their 20-year careers and as small as not knowing how to redecorate their bedrooms. Everyone in the circle listened intently, but they didn't offer advice or solutions. That's not what the circle is about, I discovered. Unlike clinical therapy or medication, or even a dose of ayahuasca, the point of the circle is not to inspire an instant revelation. It's to establish the positive changes you wish for your life, state them aloud or simply to yourself, and allow that to quietly motivate your actions. No one in the circle claims to have the answers; they're merely there to bear witness. Even the East Coast skeptic in me couldn't help but feel moved. Because, here's what I know: Women in the 21st century spend so much of their lives trying to juggle obligations, please other people, and accomplish things instantaneously. In contrast, the circle's patience-driven approach felt like a breath of fresh air. I realized that it didn't actually matter whether everyone at the gathering believed in its spiritual foundation or not. As long as we believed in our own personal reasons for being there, we belonged. Am I a New Age Convert? The remainder of the evening was filled with a similar sense of repose and camaraderie. Next, Mallis encouraged the women who'd attended gatherings in the past to share any manifestations, or goals they'd set, that had since come true. Mallis shared a successful manifestation of her own, as did the woman in paisley who'd passed out our Jasper stones. It was refreshing to behold an opportunity for women to brag about their accomplishments. In the outside world, we so rarely get to do so. Last, we all opened our moon journals and wrote down a series of intentions we hoped would manifest in the future. In closing, each of us went around the room and shared just one. Again, no feedback, no advice. Just peaceful smiles of support. By the end of the gathering, Victoria and I agreed that this wouldn't be our last. We packed up our moon swag and bid our hosts farewell, our brains cloaked in a warm haze. I had shown up a cynic and left a sucker. And I wasn't even mad about it. So, have I been converted to a life of New Age healing? Will I be replacing my ibuprofen with shamanic herbs and consulting my astrological chart every time my car runs out of gas? Truthfully, I can't say that I will. But having stepped 3,000 miles outside my comfort zone, I have a newfound understanding of something that, my whole life, I thought was utter nonsense. It's a beautiful thing to watch people commit so fully to pursuing happiness, even if their methods weren't invented by a man in a lab coat. Maybe it's naive to think of holistic healing this way. Or maybe it's a sign of growth. As of now, I have set my intentions to keep learning. Do you have a spiritual practice you swear by? Tell us all about it in the comments below!